True. I wasn't thinking about those with no thumbs. Sorry. Tell that to all the dumb people that visit all the dumb blogs. Just because you are smart enough to decipher between the BS, doesn't mean everyone else is. That's a good point actually. To be honest, I'm just pretty jaded about this macro discussion. I'll bow out. I do feel more homegrown attempts to cover media will eventually replace the big sites in influence. Look at gaming magazines. Totally irrelevant these days. Oh sorry, we've sort of moved on from the initial image. 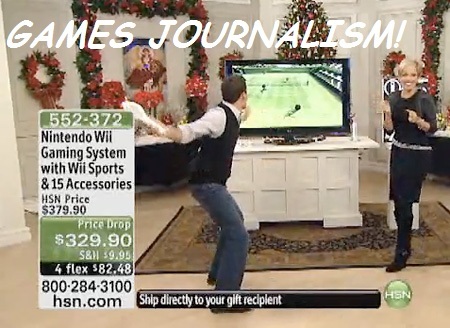 The discussion is about some very apparent, very fundamental problems with gaming 'journalism' right now. Who would have thought that when it was all said and done the Hip Hop Gamer would be the one to walk away with all the integrity and dignity. Even if he considered himself the later, that person is not above criticism either. Being a ridiculious, vapid shill is being a ridiculious vapid shill, even if you own it. For the record, in general, I do not put Keighley in the later category. I think in this case he showed some really bad judgement, however. 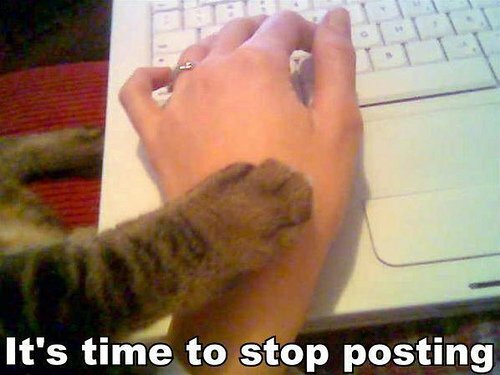 Anyone who's ever been to Kotaku. A bit of both. Every now and then he will step off and do some real journalism and really good interviews but he's shackled by working with spike/gametrailers so much. I think if he was free of those wastelands and went somewhere more resistant to that garbage he'd fit in pretty well and get to do a lot more real journalism. Hmm I'm not sure what the intent would be of someone doing an unboxing video? Surely this would either be to show off about what you got that others haven't or to advertise something that is coming out soon and to raise awareness. Independent bloggers and retailers I can understand doing this but the Gaming Press? I'm sure you can see how this looks. For the record, I think it's worth mentioning that Geoff does not look very content in that image. I don't know if that matters, but at least he's not a literal shill and also arrogant about it (Wainwright). He seems to at least have had a sense of what he was doing, unlike most others- who apparently did not actually study journalism and/or were never introduced to basic ethics. Ever since he did that Oculus Rift video, I've been a fan. The problem, like I mentioned before, is the gap between how you see yourselves and how we see you. You see yourselves as fundamentally good and honest people that constantly have to make deals with the devil to do work that you love. You think that being friendly with PR is just part of the job and there's nothing wrong with it. You think that endemic advertising on your sites doesn't make a difference in how you write about the product. We see you as being chummy with the salesmen that are constantly lying to us directly or indirectly and trying to get us to buy absolutely everything that comes out. We think you're friends with them and very naturally don't want to piss them off. We see a good review for a game surrounded by ads for that same game and think there is obviously monetary influence at play. Now I'm sure that reality lies somewhere between these two points, closer to one or the other depending on the site and the writer. I am certainly willing to give people the benefit of the doubt and I definitely don't think that most or even a good number of you are on the take. But the reaction to this mess has made the contrast between your audience's viewpoint and your own all the more stark. From your point of view the Twitter reactions are just jokes, and putting myself in your shoes it makes sense. People are constantly accusing you of being totally corrupt so I'm sure it becomes very difficult to tell the difference between that and someone who genuinely wants to engage you in conversation on these issues. For the average gamer though, we see someone decry PR shilling in an article immediately lose his job over legal threats, followed by mockery towards the article, its precepts, and the readers that are taking it seriously all coming from what looks like a combined group of writers and PR acting very friendly with one another. Very well put. It's unfortunate that so many of you are viewing things with such cold cynicism. One solution might be for people like me to be as transparent as possible and be willing to engage in conversation on these issues, which is one of the reasons I'm posting in this thread. But it's tough to talk about that when the conversation keeps swinging back to the fact that Kotaku is doing something evil because we took 10 minutes to show people what's in the Halo collectors edition but we're not interested in putting a great deal of time into a story about media issues. Regardless, to address what you said: I had no idea that people were reacting so extremely to those silly tweets until I saw this thread hours after I made them. I can see your perspective to be sure. But the major reason I'm joking about the idea of someone advertising to win a PS3 is because it's so absurd in the first place that anybody would think it's OK to advertise to win a PS3. I am completely detached both mentally and geographically from these incidents, as are many other reporters I've spoken to. On that same level, the idea that PR people are pulling the strings behind every outlet is also absurd and so at odds with everything I do every day that joking about it is a natural response. But you're right: I can see exactly why it feels like a slap in the face to see me joking about something like that if you actually believe that me and my colleagues are corrupt or shady or unethical or whatever else. I get that. Ultimately, as I've said before, I'm of the belief that good work speaks for itself. I am extremely concerned with being fair, honest, and transparent no matter where I write or speak, and I have some rather strict ethical standards that I laid out earlier in this thread. My job is to continue to make that as clear as possible. I think there will always be people who believe that game journalism is corrupt, and I think my time is better spent worried about doing good game journalism. And I think it's OK for one website to be a forum for a great deal of things. I think it's OK for us to spend ten minutes writing about trailers or unboxing Halo videos while also spending the majority of our time reporting and writing stories about the state of StarCraft as an eSport or the crazy history behind X-Men Destiny. We post some 60 things a day: not every single one of those is going to be a monumental piece of investigative reporting. There's room on Kotaku for all kinds, you know? I agree with you there. Unboxing videos are free advertising and terrible. I just think it's silly that when people lament the bigger sites -- the ones that actually pay their employees -- getting free games (review materials) from publishers. Yet they are often the ones targeted. It's the smaller fan sites -- the ones who "pay" their writers with free games, and have even less of a layer between PR/advertising and editorial -- that are the most susceptible to corruption, yet those are not the ones focused on here. Folks, please don't all jump on my throat for this, but what exactly is wrong with unboxing a collector's edition so people can see what's inside and decide whether or not they want to buy it? It's hardly investigative journalism, but it seems like a useful service to readers who want to get a visual on what's inside those things. Microsoft PR literally bought that article: if they hadn't sent that to Kotaku the unboxing would have never happened. This piece is an infomercial. This whole ordeal has revealed that the PR/journalist symbiosis is worse than we thought--the press doesn't even realize they are being manipulated. If Microsoft came to Totilo and said "Make a video advertising Halo 4" he would have been incensed. Instead they give him freebies knowing how he's going to react. Agreed. I think Geoff possesses some real competence, but is like most people often restrained by his circumstances, which is not exactly unusual when it comes to working for big companies. John Davison (1UP, What They Play, CBS whatever it was, something mobile) smelled the bacon a while ago, too, when he noticed how huge Machinima is on Youtube. Question is: would he want to? I'm sure playing ball affords a lot more interview opportunities than not. I see a problem where Totilo is flat out refusing to engage over the issue or non-issue of PR influence. If it's not an issue, then explain why the "conspiracy theorists" are wrong, otherwise it comes across as sweeping the issue under the rug and wanting the whole thing to go away. It's not a conspiracy. It's basic psychology that a lot of game writers have convinced themselves they are immune to, apparently. And this is almost an even bigger issue right there. Posting non-news for page hits completely demeans any legitimate article Kotaku and others could bring to the table. has someone reposted those Shawn Elliot posts about PR he did earlier in this thread? Those posts where a great intelligent way of showing what is going on with PR and the games press. Maybe jschreier missed that. I think he would find them pretty eye opening. I am really sorry but this seems like damage control to me. I admire your effort but it's like we just don't understand each other. On that same level, the idea that PR people are pulling the strings behind every outlet is also absurd and so at odds with everything I do every day that joking about it is a natural response. Then why don't you write an article about it? Has there ever even been a 4000+ post thread on GAF about some issue that Kotaku didn't acknowledge? Write an article explaining how you, and gaming journalists as a whole, are immune to this apparent problem. You don't have to agree with us to acknowledge that this is obviously an issue that people are interested in- so why aren't you reporting it? You are coming across as deceitful at worst, and delusional at best. Because theres always the possibility that someone will make a response article, and that is scary. Even if he did want to write it, would Totillo even let him? They're too comfortable with the way things work. Why would they report on their comfy couch when they're simply comfy on it? No. This kind of stuff actually diminishes the discussion and makes the people discussing this issue seriously look bad. Calling it a conspiracy gives the PR/journos a lot of ammunition to make people here look like nutjobs, as opposed to people who just want the conflicts of interests and general media hackery to stop. Yeah, I reworded it a bit because I realize the wording "vast conspiracy" feels a lot like "vast right-wing conspiracy" or something like that. And people generally associate the word conspiracy, in general, with crazies. But is using the word conspiracy really very far off here? What I want to ask is this &#8211; why were other parties involved in this mess happy for Lauren to take all the heat? Why were her friends happy to let her take the heat? I am furious because yesterday the games PR and marketing men flung a few people under a bus, and today they&#8217;re probably sipping drinks at the Golden Joystick awards. I am furious that some people think we should all just &#8220;move on&#8221; from this, allowing the PR people to get back to their narrative. I am furious that some are saying that it&#8217;s &#8220;just games&#8221;. It&#8217;s not games. It&#8217;s writing. And writing matters. Writing always matters. Awful, partly, because I&#8217;ve discovered that the games press is controlled by PR to a greater extent than I had ever dreamed &#8211; and I&#8217;m a pessimist. These are Robert Florence's words, not mine. I don't think it's crazytown to use the word conspiracy in this context... it's actually a pretty literal use of the word. Though I will try to veil my words with a little more diplomacy in future posts here. Except for articles on the relationship between games sites & PR arms of publishers, obviously(it's a pity you are getting the stick for comments made by your editor, but his comments look ludicrous when placed next too some of the content that you guys run). It is damage control. And on top of that a lot of self-congratulatory article posting which doesn't really answer anything. And remember: unique pageviews equal more cash for GM, folks. Don't support media hacks? Don't click those links. Dead on. Microsoft sends a web site something worth hundreds of dollars and that web site turns it into a video that generates ad revenue. Yeah, I doubt keep on insisting Schreirer to write something would accomplish much. Maybe he should just write something on his blog? Again, I really appreciate you posting so much in this thread, but it's like you are having a different conversation to the rest of us. There is room for all kinds, but Totillo said it was not worth discussing, then Kotakau had an unboxing. That is pretty funny, regardless of the rest of the thread. And no one has said 'evil'. Regarding the tweets, I think they were probably just defensive little jokes, but surely you can see how statements that you take something seriously may be diminshed by reading them? the Jason Schrier that fell for a crudely edited pic? the Jason Schrier that demanded evidence that it was fake rather than evidence that it was real? the Jason Schrier that had his own article criticising people for doing the same thing quoted at him? the Jason Schrier that got someone banned from another messageboard for pointing out your mistake on Kotaku and then gloated about it afterwards? the Jason Schrier that then retreated to Twitter to badmouth GAF (I'm surr they were just more of your zany jokes)? the Jason Schrier that eventually had to issue a grovelling apology to GAF? Daym, we really do forget these incidents. That thread should have been enough to write you off as a games critic forever. Even if it's an article that is of a totally dissident opinion, the idea that this should just not be acknowledged is ridiculous and there's absolutely no honest or genuine excuse for it. The kicker is, in the end, Kotaku thinks it's doing it for your benefit, like it is public service or something. The fact that you don't know is telling in itself, but then you've gone out of your way not to understand what people are criticising you for. Rab was talking about the ways PR shower gaming critics in presents, Kotaku posts a story about MS sending them $500 worth of swag, giving MS free advertising. It even mentions how it's stating things Microsoft PR instructed them to include, just as you claim Kotaku isn't about rewriting press releases. According to Totilo, everything that's been discovered in this thread -> a "non-story". A teacher dressing up as a maid in China, a story! The kicker is, in the end, Kotaku thinks it's doing for your benefit, like it is public service or something. 1.Have a significant influence on or determine (the manner or outcome of something). 2.Train or accustom (someone or something) to behave in a certain way or to accept certain circumstances. Somehow, with every post you manage to make yourself look more naive, and Kotaku worse. I respect that you came into this thread and engaged with some posters. But come on man, just stop it. No matter how many times we say it, no matter how many ways we say it, It's clear that you are living in a different special little world of yours, and that you are never going to get our point. I'm saying insisting Schreirer isn't going to do much to alter Totilo's stance on this. Doesn't Kotaku have a policy against expensive gifts? Guess it's ok if it's used as an unboxing video tho? straw man nonsense. especially insulting seeing as you've read that piece by fartofwar. yeah and the same with every other mainstream gaming outlet, room for all kinds of stories (including those anyone would deem pointless and/or shameful) - but not something that might question games writers impartiality. Who do you imagine ultimately ends up with Xbox? They are doing it for page hits and ad revenue, whether they feel the need to admit it to the gaming public or not. Sad thing is, gamers fall for this crap and other tricks like the dreaded "Top Ten" list. That's a pretty succinct demonstration of one of the core problems right there. :lol, the text is just too much. Does it matter? MS still gave it to them for free. To be fair, making money is what anyone would want for their ad-supported site. The problem is that in general the game media behind that site is quite shady with regards to media ethics and its cozy relationships with the PR end of entertainment corporations. Because I liked this blog post and really enjoyed reading it after watching the VGAs. Off topic I know but with the mention of his blog, this was the first thing I thought of honestly.